By the time we had received our scheduled fuel delivery, it was nearly midday before we got away from Chauny, but the improved weather which had been forecast had still not really arrived. In our mast-down state we are very vulnerable to rain showers, and it wasn't long before we got our first soaking, which of course coincided exactly with our arrival at the first lock. On this leg we were to cruise west along the Canal lateral à l'Oise, as far as Pont l'Evêque, and then turn north on the busy Canal du Nord, as far as its junction with the Canal de la Somme. 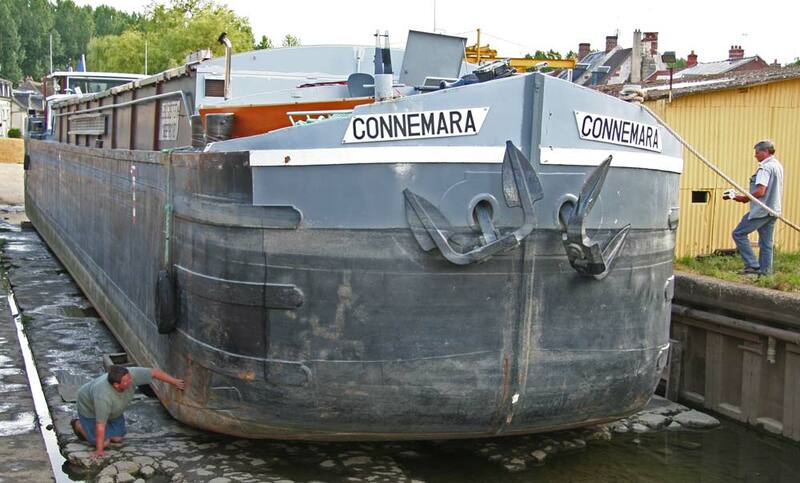 When we had first planned to cruise via the Somme we had envisaged taking the Canal St Quentin and joining the Somme at the St Simon junction. However, the more recent of our cruising guides pointed out that this 15km stretch between the Canal St Quentin and the Canal du Nord has in fact been closed since 2006. After our second lock (and soaking) we arrived at the village moorings at Pont l'Evêque. 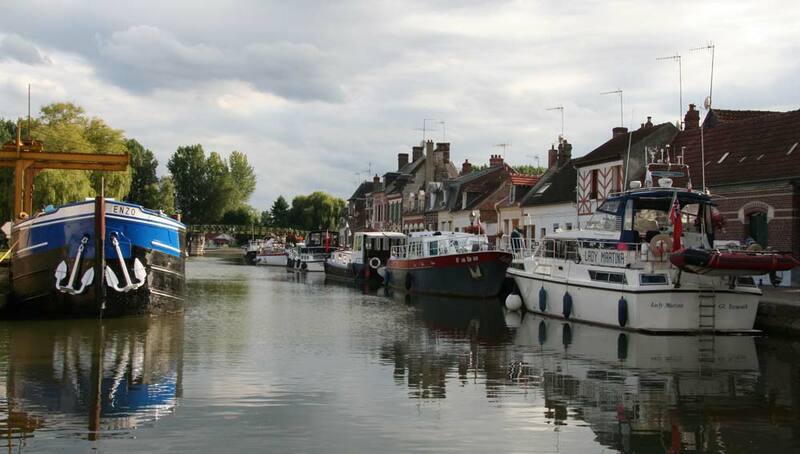 At the junction with the Canal du Nord and the busy route to the l'Oise, this is a popular stopping point for barges, and the halte plaisance shares a sheltered inlet with a barge dry-dock. There was a steady procession lining up for the opportunity to peer at their underparts, and tackle the sides with roller paint brushes. With more rain looking likely we decided it was worth investigating and opted to leave the Canal du Nord for another day. The moorings were provided courtesy of the town but, for the first time this year, we came across metered electricity and water. These were operated by 'jeton' available at the boulangerie (closed) or at the local bar. Priced at €2 a throw, we were promised 5kWh for each token, but managed to exhaust the first one in an hour, without any of our copious electrical systems even switched on. After the second token ran out an hour later we gave up on the shore power and decided to survive on the ships own power for the rest of the evening. 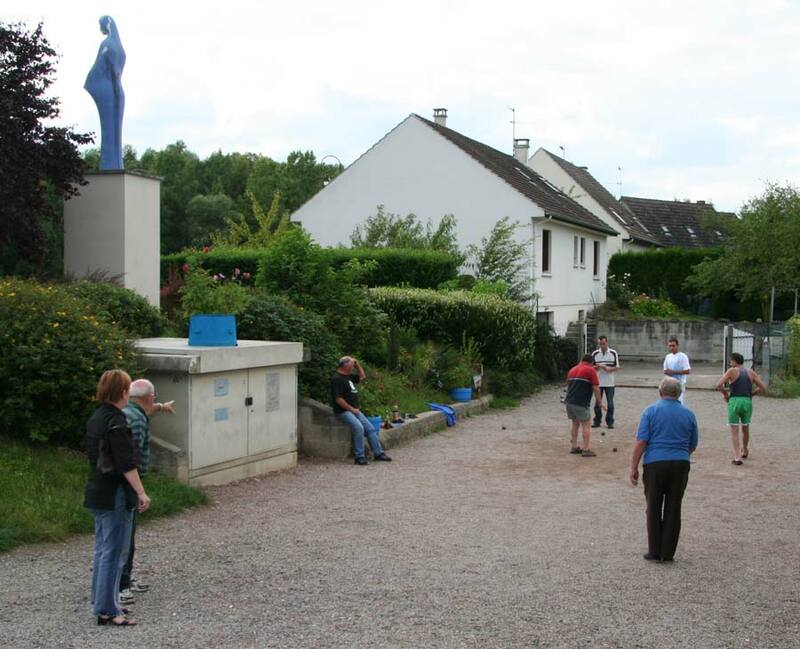 Entertainments in the village are limited to the annual boules contest, which was to take place that Saturday, for which the locals were in strict training. With the only boulanger in town away on holiday for three weeks, the best option for shopping was a 2km bike ride to the Auchan hypermarket on the other side of Noyon. This offers a fun-filled outing for all the family and, as ever, was packed out with eager shoppers. After the mainly uphill cycle our first priority was the cafe du visite, where we bumped into the crew of 'Beats Working', one of two other English boats moored alongside us, who had obviously had a similar idea.